I recently noticed that an artist I love is doing a Kickstarter, so I decided to ask him a few questions about this exciting venture. 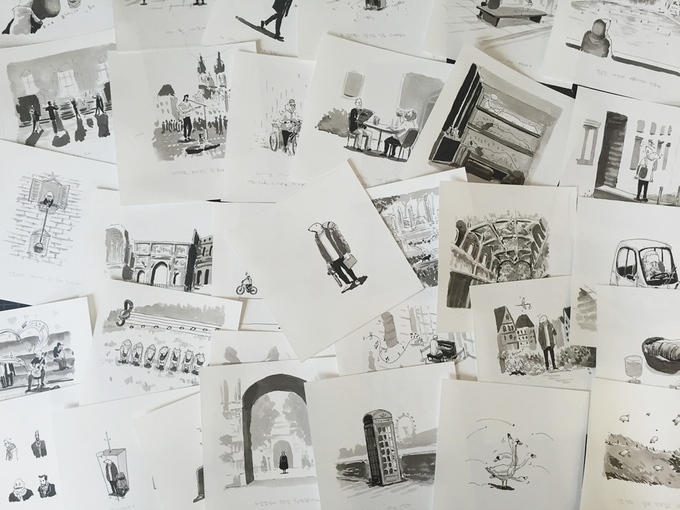 The project is to fund an art book collecting illustrations from his recent travels across Europe. Who hasn’t dreamed of winding their way through the beautiful scenery, soaking it all in and pouring themselves creatively onto the page? I see that you are from South Korea, but live in New York–what made you decide to move? In 2007, I moved to NYC for studying English and I planed to stay here only 2years. However, many huge artistic inspirations of NYC made me decide to study here, then I prepared the art school in NYC. Finally, I graduated SVA MFA Illustration program last year. When did you start drawing, and what first inspired you? I’m not sure when I started drawing because drawing was my hobby since when I was a little child. However, I started to learn drawing for arts in 2009. That was my first time to start an academic drawing. When I was a 9years old, I read a Japanese Comic “Dragon Ball” and that hugely inspired me to like drawing. After, everyday I tried to draw characters in Dragon Ball on my note. What made you decide to go to Europe, and how did you get the inspiration for this project in particular? Europe travel was one of my bucket list. While I studied arts, I believed Europe travel surely improved me as a good artist. Why did you decide a Kickstarter was the best direction for this project? There are few reasons. First, I had a financial issue so I searched ways to get funds. So, I started to look a social funding way which people called “Crowd Funding”. Kickstarter is one of the most popular website for crowd funding which means, tremendous people visit the website and could see my project. That was so huge because I also wanted to show my project to people who I never met. Florence, it was beautiful, cozy and calm. I really enjoyed to draw in there. Do you have any fun stories from the road? Every moment was great but specially I remember the moment of Oktoverfest (Munich, German). While I drew the scene of festival, one family asked me to draw their family. I gladly took their request then drew them and I made 50 Euro. I just spent 15min. I saved money for the trip. After graduated, I worked freelancer jobs. It took a half year. I noticed in the video that you mentioned the sketches becoming popular in web communities, what communities are those? Would you recommend other artists to join them? I posted the sketches in the two most popular Korean-Travel communities in Facebook. They have over 300k members. However, they focus on travel issues, I’m not highly recommend other artists join them. Unless they have works that relate with Travel topic. This entry was posted in Art and tagged adventures in europe, Art, illustration, kickstarter, moon, moonsub. Bookmark the permalink.